BAR HARBOR — Imagine, if you will, that you are a young actress, who has come to Mount Desert Island all the way from Seattle, to take the leading role of Viola in one of Shakespeare’s best loved comedies, “Twelfth Night,” in a production in Bar Harbor in August. In this case, it’s a joint Barn Arts Collective and Acadia Community Theater outdoors production that opens at the Saltair Inn Aug. 18. In the play Viola, a gentlewoman, is shipwrecked on an island. Not knowing the lay of the land, she disguises herself as a charming young man named Cesario who takes a job as a manservant for the island’s big kahuna, Duke Orsino, with whom she promptly falls in love. Alas, the duke thinks she is a boy and anyway is besotted with the beautiful and wealthy countess Olivia who in turn becomes infatuated with the Duke’s new servant Cesario. Oy. It’s a challenging role that demands the actress to seamlessly switch identities and sexes. Now imagine that this actress is also expected play the role of her own twin brother Sebastian as well as a clever and conniving member of the countess’ court named Maria. This is the situation that Marisol Rosa Shapiro has found herself in, and rather than being overwhelmed by the responsibility, at a recent rehearsal she seemed to be having a blast, changing her various identities literally at the drop of a hat or lacy fascinator hat. Perhaps her sanguine attitude about having to memorize the lines and blocking for essentially four different characters is that she is not alone in this. Lindsey Hope Pearlman and Katie Melby, both veteran Barn Arts performers are also taking on four different roles in the comedy. So, it seems that in addition to the dialogue the cast and chorus have to memorize, there are songs to be sung and boy-band style dances to learn. 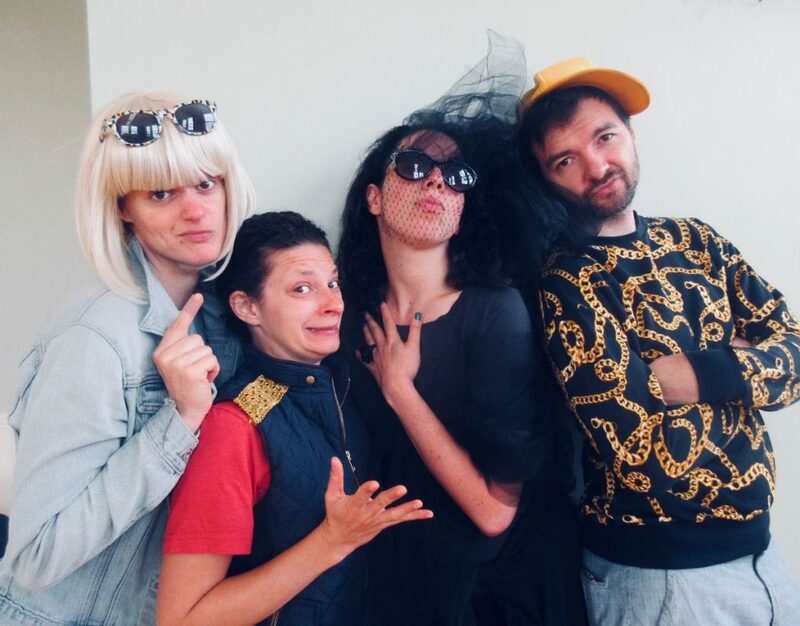 If this all sounds impossibly confusing, anyone who has seen previous incarnations of this Barn Arts production of Twelfth Night or last year’s “The Tempest,” knows they will almost certainly pull it off in fine and hilariously funny style. As the four principal cast members scurry about the rehearsal space at Harbor House, trying to figure out where to stash a costume for their next character change or some other technical dilemma and Simon maps out their exits and entrances on an invisible set, it seems like they’ve got a lot to do in just five days before opening on the lawn of Saltair. But each time they run through a scene, it gets smoother and each actor adds an ingenious bit of funny business that makes it that much better, which suggests that each of the four performances will offer new delights. “Twelfth Night” will be performed on Saturday and Sunday August 18 and 19 at 3 p.m. on the lawn of the Saltair Inn, 121 West Street in Bar Harbor. It will then move to the Northeast Harbor Marina the following Saturday and Sunday for two 3 p.m. performances on August 25 and 26. There will be no charge for the performances, but patrons are encouraged to donate to help cover production costs. Anyone who attends must bring their own lawn chair or blanket, as well as sunscreen and appropriate clothing for an outdoor performance. The performance will be canceled in case of inclement weather. Visit acadiacommunitytheater.org or Acadia Community Theater on Facebook.